Total existing-home sales, completed transactions that include singlefamily homes, townhomes, condominiums and co-ops, decreased 6.4 percent from November to a seasonally adjusted rate of 4.99 million in December. 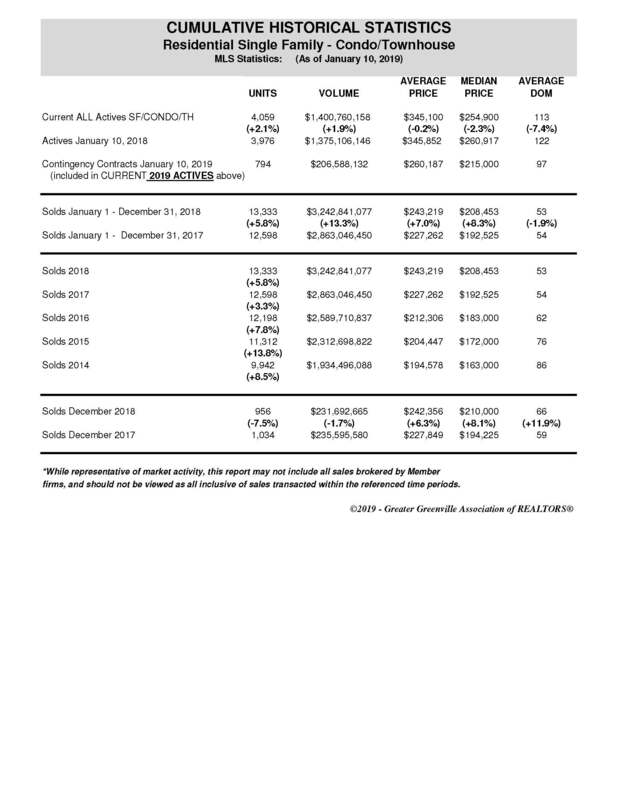 Sales are now down 10.3 percent from a year ago (5.56 million in December 2017). The median existing-home price for all housing types in December was $253,600, up 2.9 percent from December 2017 ($246,500). December’s price increase marks the 82nd straight month of year-over-year gains. Total housing inventory at the end of December decreased to 1.55 million, down from 1.74 million existing homes available for sale in November, but represents an increase from 1.46 million a year ago. Unsold inventory is at a 3.7month supply at the current sales pace, down from 3.9 last month and up from 3.2 months a year ago. First-time buyers were responsible for 32 percent of sales in December, down from last month (33 percent), but the same as a year ago. NAR’s 2018 Profile of Home Buyers and Sellers – released in late 2018 – revealed that the annual share of first-time buyers was 33 percent. December existing-home sales in the Northeast decreased 6.8 percent to an an nual rate of 690,000, 6.8 percent below a year ago. The median price in the North east was $283,400, which is up 8.2 per cent from December 2017. In the Midwest, existing-home sales fell 11.2 percent from last month to an an nual rate of 1.19 mil lion in December, down 10.5 percent overall from a year ago. The median price in the Midwest was $191,300, un changed from last year. Existing-home sales in the South dropped 5.4 percent to an annual rate of 2.09 million in December, down 8.7 percent from last year. The median price in the South was $224,300, up 2.5 percent from a year ago. What a REALTOR® Can Do For You! As an association of more than 2900 licensed agents in the Greater Greenville area, we talk all the time about why you should use a REALTOR® to help you, whether you are looking to purchase or sell a new or existing home. A REALTOR® doesn’t just put a sign out in the yard and wait for the home to sell itself. There are so many facets of the process that one might not think can be enhanced by using an experienced real estate agent. Aside from these duties though, it is also important to remind folks some of the other things that the common buyer or seller might not consider. These include choosing relevant resources that can be either required or pertinent to the process. An experienced agent can give you important advice throughout the process, but also provide a list of contacts to help you before, during, and after the final papers are signed at the closing table and the keys to your home are in hand. When purchasing a home, especially if it will be your first home, the list of action items might include any or all events listed below. Your REALTOR® can be an invaluable resource in helping you choose competent professionals and make sure these events are scheduled in a timely manner that adheres to your contractual agreement. - Incidental after close resources like locksmiths, painters, renovation specialists, contractors, etc. Preparing your home for sale can be even more important because prior to letting the first prospective buyer through the front door, there are many factors that should be completed which can help to get you top dollar. Your REALTOR® can also be there to help the process run smoothly from contract to closing. - Pre-listing issues relating to prep work such as carpet cleaners, painters, contractors, pressure washers, etc. The main thing to remember is that using a REALTOR® gives you assurance that you are working with an educated, licensed professional, tasked to uphold a strict code of ethics that will help to guide you every step of the way. Want to know more about smart home devices, but don’t know where to start? These one-sheet introductions to the major smart home device categories can help! WOW, the market is as good as I can remember in my 17 years in real estate! That is typically the response I have when someone asks me about business. Actually the first question is usually, how have you been and how is your family? But, if the person knows who I am, they will soon ask how business is going. Since the business of real estate seems to always be on the back of everyone's mind, mainly because everyone's home tends to be one of their biggest investments, it is a topic many like to hear about from a practicing professional. 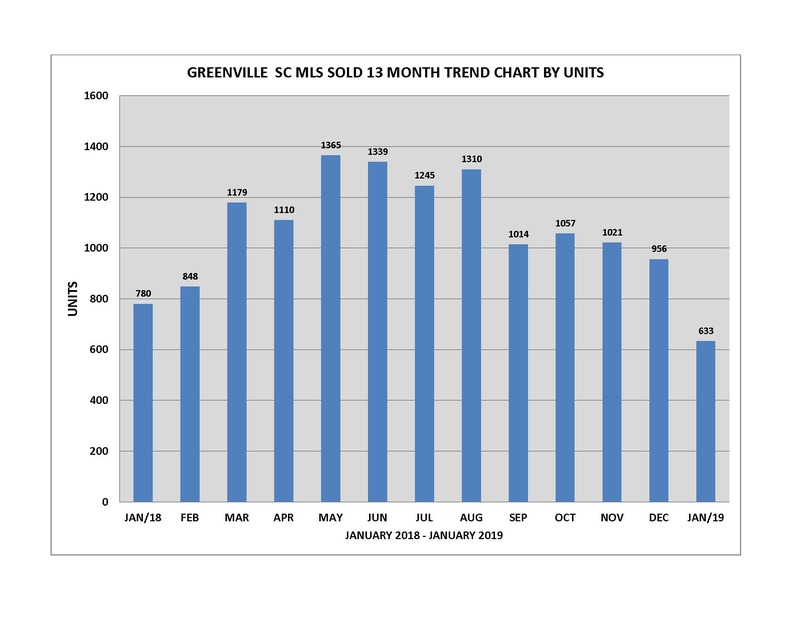 Let's take a quick look at one of the most recent Multiple Listing sold statistics for Greenville, released by our association on February 12, 2015. Our current inventory shows about the same number of active listings as this same time last year, but the average price is up 7.3%. This would indicate definite optimism is continuing to thrive. The actual average sold price is up 8%! 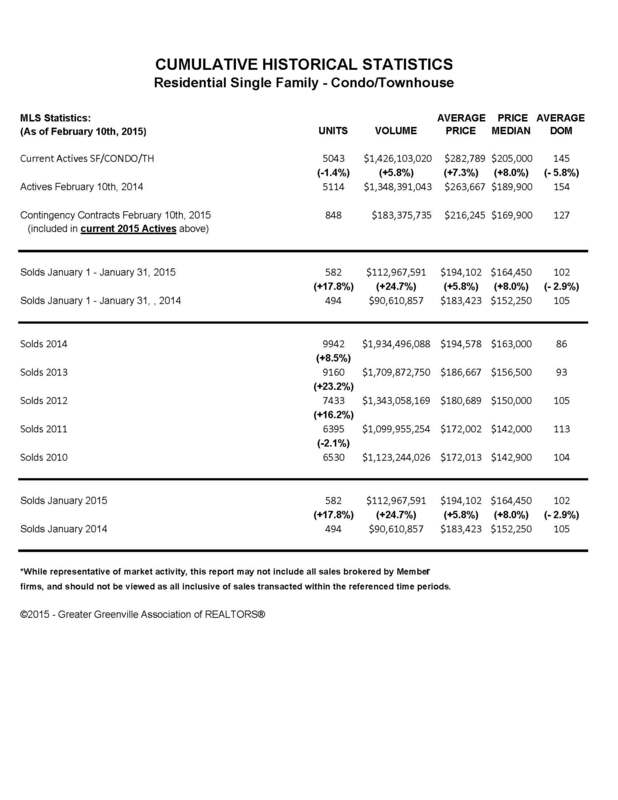 The number of sales year to date is up almost 18% and days on the market down almost 6%. If you take into consideration that inventories have remained low for the past two years, you can understand how demand would be at an all time high. This fact might lead many to believe that they don't need to assistance of a professional when selling their home. For those who are thinking along these lines, let me list some of the road blocks to a successful real estate transaction: Over pricing leads to failed transaction due to appraisals coming in low. Non disclosure issues can lead to discovery from inspections and in some cases litigation from these non disclosures. Multiple offers from unrepresented purchasers can lead to anger from the parties who lost, or even regret from the parties who won...leading in some cases to litigation from these individuals. These can certainly be worst case scenarios, but when you add in the benefits I can provide, like recommended attorneys, lenders, inspectors, home staging consultants, contractors (from plumbers to pest control experts) and a host of others, how can one think you wouldn't be better off with a licensed and experienced professional to handle the transaction? Remember, the market is hot! Don't let what may be the biggest financial decision in your life be your worst. Call a real estate professional like myself to get your moving in the right direction!